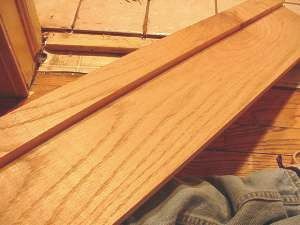 Thresholds are common fixes for areas where the floor is at different levels. This commonly occurs when putting a new floor covering over an existing floor. Tile floors are a common culprit due to the use of cement board and other substrates. The first task is to identify what kind of threshold you need. In the pictured installation there was a little bit of plywood protruding from under the tile. We chose an oak threshold that fit over the plywood edge but was still wide enough to fill the doorway. Your project may not have all of these factors but we chose a complicated installation to illustrate the possibilities. For this project you will need a drill, spade and twist bits, sandpaper (power sander is handy), hand saw, screws, wood glue and dowels to fill the holes (countersinks) you drill. Use safety precautions with power tools - eye and ear protection.